A liquid cleaning and/or cleansing composition comprising non-spherical and/or non-rolling abrasive cleaning particles derived from a foam structure comprising a plurality of struts, wherein the abrasive cleaning particles comprise a plurality of filler particles at least partly incorporated therein, wherein the particle size of the abrasive cleaning particles is greater than the particle size of the filler particles and wherein the ratio of the mean area-equivalent diameter of the filler particles to the abrasive cleaning particles is from 0.01 to 0.2, the area-equivalent diameter being measured according to ISO 9276-6. The present invention relates to liquid compositions for cleaning and/or cleansing a variety of inanimate and animate surfaces, including hard surfaces in and around the house, dish surfaces, hard and soft tissue surface of the oral cavity, such as teeth, gums, tongue and buccal surfaces, human and animal skin or hair, car and vehicles surfaces, etc. More specifically, the present invention relates to liquid scouring compositions comprising suitable particles for cleaning and/or cleansing. Most preferably the present invention relates to a hard surface composition for treating inanimate hard surfaces. Amongst the currently known scouring compositions, the most popular ones are based on abrasive particles with shapes varying from spherical to irregular. The most common abrasive particles are either inorganic like carbonate salt, clay, silica, silicate, shale ash, perlite and quartz sand or organic polymeric beads like polypropylene, PVC, melamine, urea, polyacrylate and derivatives, and come in the form of liquid composition having a creamy consistency with the abrasive particles suspended therein. The surface safety profile of such currently known scouring compositions is inadequate alternatively, poor cleaning performances is shown for compositions with an adequate surface safety profile. Indeed, due to the presence of very hard abrasive particles, these compositions can damage, i.e., scratch, the surfaces onto which they have been applied. To address some of these problems, shaped abrasive particles such as those described in EP 2 338 966 A1 have been developed in order to provide effective cleaning and surface safety. However, there still remains a need to improve the cleaning abilities of abrasive particles as well as simplifying the processability necessary to ensure appropriate particle shape as well as strength. There is a further need for such abrasive particles to effectively biodegrade into the environment in order to meet the ever important needs of green technology. It is thus an objective of the present invention to provide a liquid cleaning and/or cleansing composition suitable to clean/cleanse a variety of surfaces, including inanimate and animate surfaces, such hard surfaces in and around the house, dish surfaces, hard and soft tissue surface of the oral cavity, such as teeth, gums, tongue and buccal surfaces, human and animal skin, etc., wherein the composition provides good cleaning/cleansing performance, whilst providing a good surface safety profile, particle grindability, as well as effective biodegradation. It is an advantage of the compositions according to the present invention that they may be used to clean/cleanse inanimate and animate surfaces made of a variety of materials like glazed and non-glazed ceramic tiles, enamel, stainless steel, Inox®, Formica®, vinyl, no-wax vinyl, linoleum, melamine, glass, plastics, painted surfaces, human and animal skin, hair, hard and soft tissue surface of the oral cavity, such as teeth enamel, gums, tongue and buccal surfaces, and the like. A further advantage of the present invention is that in the compositions herein, the particles can be formulated at very low levels, whilst still providing the above benefits. The present invention is directed to a liquid cleaning and/or cleansing composition comprising non-spherical and/or non-rolling abrasive cleaning particles derived from a foam structure comprising a plurality of struts, wherein said abrasive cleaning particles comprise a plurality of filler particles at least partly incorporated therein, wherein the particle size of said abrasive cleaning particles is greater than the particle size of said filler particles and wherein the ratio of the mean area-equivalent diameter of said filler particles to said abrasive cleaning particles is from 0.01 to 0.2, the area-equivalent diameter being measured according to ISO 9276-6. The present invention further encompasses a process generating shaped non-spherical and/or non-rolling abrasive cleaning particles for use in a liquid cleaning and/or cleansing composition, the process comprising the steps of: blending an effective amount of filler particles with one or more thermoplastic or thermoset material precursors to form a homogeneous solution, wherein the filler particles have an area-equivalent diameter of from 1 µm to 70 µm as measured according to ISO 9276-6; foaming the homogeneous solution; and grinding the foam to generate the abrasive particles. Fig. 1 is drawing showing an illustration how to calculate the tip radius. Fig. 2 is drawing showing an illustration how to calculate foam strut aspect ratio. As used herein "abrasive particles" means abrasive cleaning particles derived from fragmenting (by grinding, milling or other suitable processes) a foam structure comprising a plurality of struts. As used herein "struts" are essentially tubular (solid or hollow) structures exhibiting good resistance to compression across the length thereof. Such essentially tubular structures typically forming an interconnected array of open pore cells therebetween generating the open cell structure of the foam. As used herein "substantially water-insoluble" means that the material referred to has a solubility of less than 30g per 100g of water, preferably less than 20g per 100g of water, more preferably less than 10g per 100g of water, more preferably less than 5g per 100g of water, even more preferably less than 2g per 100g of water, most preferably less than 1g per 100g of water, at room temperature (20°C) and atmospheric pressure (101 kPa). The compositions according to the present invention are designed as cleaners/cleansers for a variety of inanimate and animate surfaces. Preferably, the compositions herein are suitable for cleaning/cleansing surfaces selected from the group consisting of inanimate surfaces, animate surfaces, and combinations thereof. In a preferred embodiment, the compositions herein are suitable for cleaning/cleansing inanimate surfaces selected from the group consisting of household hard surfaces; dish surfaces; surfaces like leather or synthetic leather; and automotive vehicle surfaces. In an another preferred embodiment, the compositions herein are suitable for cleaning/cleansing animate surfaces selected from the group consisting of human skin; animal skin; human hair; animal hair; and inter-dental areas such as teeth, gums and the like. In a preferred embodiment herein, the compositions herein are neutral compositions, and thus have a pH, as is measured at 25°C, of 6 to 8, more preferably 6.5 to 7.5, even more preferably 7. In other preferred embodiment compositions have pH above 4, preferably above 7, more preferably above 9, most preferably above 10.5 and alternatively have pH preferably from 2 to below 9, preferably from 2.5 to 7.5. Other suitable bases include ammonia, ammonium carbonate, all available carbonate salts such as K2CO3, Na2CO3, CaCO3, MgCO3, etc., alkanolamines (as e.g. monoethanolamine), urea and urea derivatives, polyamine, etc. The compositions herein may comprise an acid to trim its pH to the required level, despite the presence of an acid, if any, the compositions herein will maintain their preferably neutral pH as described herein above. A suitable acid for use herein is an organic and/or an inorganic acid. A preferred organic acid for use herein has a pKa of less than 6. A suitable organic acid is selected from the group consisting of citric acid, lactic acid, glycolic acid, succinic acid, glutaric acid and adipic acid and a mixture thereof. A mixture of said acids may be commercially available from BASF under the trade name Sokalan® DCS. A suitable inorganic acid is selected from the group consisting hydrochloric acid, sulphuric acid, phosphoric acid and a mixture thereof. A typical level of such an acid, when present, is of from 0.01% to 5.0% by weight of the total composition, preferably from 0.04% to 3.0% and more preferably from 0.05% to 1.5 %. In a preferred embodiment, the composition according to the present invention contains citric acid, preferably alone or in combination with other acids, at a level of from greater than 0% to less than 0.5% by weight of the composition. It has surprisingly been found that citric acid at this level improves the cleaning effect of the abrasive particles. In another preferred embodiment according to the present invention the compositions herein have a water-like viscosity. By "water-like viscosity" it is meant herein a viscosity that is close to that of water. Preferably the liquid compositions herein have a viscosity of up to 50 cps at 60 rpm, more preferably from 0 cps to 30 cps, yet more preferably from 0 cps to 20 cps and most preferably from 0 cps to 10 cps at 60 rpm and 20°C when measured with a Brookfield digital viscometer model DV II, with spindle 2. The liquid cleaning and/or cleansing composition herein comprise abrasive cleaning particles that are selected or synthesized to feature very effective shapes, e.g. defined by macroshape and mesoshape descriptors whereas effective shape of particles are obtained by reducing a foam material into particles. The applicant has found that non-spherical and/or non-rolling and preferably sharp abrasive cleaning particles provide good soil removal and low surface damage. The applicant has found that very specific particle shapes can be obtained from foam structures and incidentally, the shape of the resulting particles promote effective sliding of the abrasive particles vs. more typical abrasive particles e.g. produced from un-foamed material where rolling movement is rather promoted and is less effective in displacing soil from the surface. The applicant has found that non-rolling and/or non-spherical abrasive cleaning particles provide good soil removal and low surface damage. Indeed the applicant has found that such shapes provided by grinding foamed structures promote effective sliding of the abrasive particles vs. typical abrasive particles, where rolling movement is rather promoted and which are less effective in displacing soil from the surface. Additionally, the abrasive particles have preferably a multitude of sharp edges which are typical features of particles produced from foam structures defined by the present invention. The sharp edges of the non-spherical particles are defined by edges having a tip radius below 20 µm, preferably below 8 µm, most preferably from 5 µm to 0.5 µm. The tip radius is defined by the diameter of an imaginary circle fitting the curvature of the edge extremity. The applicant has found that particles obtained from grinding foams typically feature particles with sharp edges that are the result of the foaming process. Blowing agents, either gas or volatilized solvent optionally with/without addition of tensioactifs or polymeric agents, help during the foaming process to sharpen the foam material edges (or struts) owing to the curvature of the expanding bubble. Figure 1. is an illustration of tip radius. The abrasive particles are composed of the same foam material from which they are produced. Incidentally, the abrasives can be produced from thermoplastic material comprising foams or from thermoset material comprising foams. Such foams comprise a plurality of struts, typically forming an intricate and reticulated structure with pores therebetween to produce a substantially open cell foam structure with interconnected pores. Preferably the abrasive particles are made from a material comprising, preferably consisting essentially of, more preferably consisting of, a thermoplastic material, more preferably a biodegradable thermoplastic material preferably selected from the group consisting of biodegradable polyesters preferably selected from the group consisting of polyhydroxy-alkanoates preferably selected from polyhydroxyButyrate, polyhydroxyButyrate-co-valerate, polyhydroxyButyrate-co-hexanoate and mixtures thereof, poly(lactic acid), polycaprolactone, polyesteramide, aliphatic copolyesters, aromatic copolyesters, and mixtures thereof; thermoplastic starch; cellulose esters particularly cellulose acetate and/or nitrocellulose and their derivatives; and mixtures thereof; preferably a blend of a biodegradable polyester and a thermoplastic starch. More preferably the abrasive particles are made from a material comprising, preferably consisting essentially of, more preferably consisting of, a thermoplastic material, more preferably a biodegradable thermoplastic material preferably selected from the group consisting of petroleum-based polyesters preferably selected from the group consisting of polycaprolactone, polyesteramide, aliphatic copolyesters, aromatic copolyesters, and mixtures thereof; thermoplastic starch; cellulose esters particularly cellulose acetate and/or nitrocellulose and their derivatives; and mixtures thereof; preferably a blend of biodegradable petroleum-based polyester and a thermoplastic starch, preferably a blend of polycaprolactone and a thermoplastic starch. Particles made from such materials exhibit good structural properties in terms of hardness and rigidity as well as processability and effective biodegradability. The abrasive particles of the present invention further comprise, at least partly incorporated therein, substantially water-insoluble filler particles. The abrasive particles having a particle size that is greater than the particle size of the filler particles. The filler particles are sized such that the ratio of the mean area-equivalent diameter of the filler particles to the abrasive cleaning particles mean area-equivalent diameter is from 0.01 to 0.2.Abrasive cleaning particles comprising filler particles so sized exhibit good friability upon shear whilst still being sufficiently resistant to external stresses for good cleaning of a variety of soils on a variety of surfaces. Moreover, such filler particles enable more effective biodegradation of the abrasive particles. In an embodiment, the filler particles are sized such that the mean area-equivalent diameter of the filler particles is from 0.01 to 0.4, preferably from 0.05 to 0.35, more preferably from 0.1 to 0.3, even more preferably from 0.1 to less than 0.3, most preferably from 0.1 to 0.25, times the mean area-equivalent diameter of the struts of the foam from which the particles are derived. Particles have size defined by their area-equivalent diameter (ISO 9276-6:2008(E) section 7) also called Equivalent Circle Diameter "ECD" (ASTM F1877-05 Section 11.3.2). Mean ECD (or mean area-equivalent diameter) is calculated as the average of respective ECD of each particles of a particle population desirably of at least 10 000 particles, preferably above 50 000 particles, more preferably above 100 000 particles after excluding from the measurement and calculation the data of the particles having area equivalent diameter (ECD) of below 10 microns. Mean data are extracted from volume-based vs. number-based measurements. The same method is used for measuring the mean ECD of particles (abrasive particles and/or filler particles) as well as of the struts except that for measuring the mean ECD of the filler particles, particles with ECD below 10 microns are not excluded. In a preferred embodiment the filler particles have a mean area-equivalent diameter of from 1 µm to 70 µm, preferably 1 µm to less than 60 µm, more preferably from 2 µm to less than 50 µm, even more preferably from 2 µm to less than 45 µm, most preferably from 5 µm to less than 30 µm, as measured according to ISO 9276-6 (. If the filler particles are too big, they impact the structural resistance of the abrasive particles which is detrimental to cleaning performance. Particularly desirable are filler particles having mean area-equivalent diameter of less than 50 µm, preferably less than 30 µm, as these provide a good balance between friability, structural strength and biodegradability. Particularly desirable are filler particles having mean area-equivalent diameter of above 1µm, preferably above 2µm, and more preferably above 5µm as these are easily and homogeneously dispersed within the thermoplastic or thermoset matrix thus ensuring homogeneity of physic-chemical performance of the abrasive particles. Preferably, the abrasive cleaning particles consist essentially of biodegradable abrasive cleaning particles and the thermoset or thermoplastic material consists of a biodegradable material, preferably said biodegradable abrasive cleaning particles having a biodegradability rate of more than 50%, preferably more than 60%, more preferably more than 70% according to ASTM6400 test method. When the filler particles used comprise a material selected from natural mineral materials such as talk, mica, barium sulfate, wood, walnut, kaolin and the like, the biodegradability rate is calculated based on the biodegradation of the abrasive particle excluding the actual filler.In a preferred embodiment the filler particles comprise a material selected from the group consisting of organic, in-organic and mixtures thereof. Preferably the organic material is selected from vegetal feedstock essentially cellulose or lignocellulose based material e.g. : nut shell, wood, cotton flax or bamboo fibers, corn cob, rice hull, sugars and more generally carbohydrate especially starch from corn, maize, potato, alternatively urea, etc; other plant parts selected from the group consisting of stems, roots, leaves, seeds, and mixtures thereof. In a preferred embodiment, especially when the matrix material is made of thermoplastic with high crystallinity, the filler is made of starch with high content of amylose and low content of amylopectin (by "low" it is meant less than 10%, preferably less than 5%, more preferably less than 1%, by weight of the starch). Indeed, the amylose are typically low branched carbohydrate that allow fast and efficient crystallisation of the thermoplastic hence promoting better foam formation and material with better mechanical and chemical resilience. Typically, starch filler with amylose content above 30%, preferably above 50% are especially preferred since such have been found not to prevent or significantly reduce the rate of crystallization leading to particles with better strength and shape. Polymeric fillers may also be used and are selected in order to meet mechanical, rheological and/or hardness requirements. The polymeric fillers are preferably biodegradable and solid at reaction and use temperatures (from 0°C to 100°C) to provide effective hardness and mechanical properties of the abrasive particles. Suitable examples of polymer fillers are selected from the group consisting of polyhydroxy-alkanoates, poly(lactic acid), polycaprolactone, polyesteramide, aliphatic copolyesters, aromatic copolyesters, and mixtures thereof; starch; and mixtures thereof. The fillers may be selected from in-organic material wherein the inorganic material is having a specific gravity of from 1 to 3 and mohs hardness comprised between 1-4. Suitable example of in-organic fillers are derived from sulfate, or carbonate metal salts, such as Ca2CO3, MgSO4, barite, generally phyllosilicate material e.g. ; talc, kaolinite, vermiculite, mica, muscovite, pyrophillite, bentonite, montmorrillonite, feldspar, etc, , and mixtures thereof. Alternatively, non-biodegradable polymeric fillers may be used, although it is preferred not to use them in high quantities when substantial biodegradation level of the abrasive particles is desired. In this case, non-biodegradable polymers can be used in quantity not exceeding 10% of the weight of the biodegradable polyurethane. Suitable non-biodegradable polymeric fillers can be selected from the group consisting of polyethylene, polypropylene, polystyrene, polyvinyl chloride (PVC), polyacrylate, non-biodegradable polyurethane, and their derivatives and mixtures thereof. It is highly preferred that the filler particles are comprised at a level of from 5% to 60%, preferably from 10% to 60%, preferably from greater than 15% to 60%, more preferably from 20% to 60%, most preferably from greater than 30% to 60%, by weight of the composition. Such high levels of filler particles enables to reduce the cost of the abrasives as well as still meeting the structural requirements and improving biodegradability when needed. In a preferred embodiment, the filler particles are incorporated into the abrasive cleaning particles in such a way that at least part of said filler particles protrude from the outer surface of said abrasive particles. Such is to promote overall particle roughness and improve its cleaning properties. 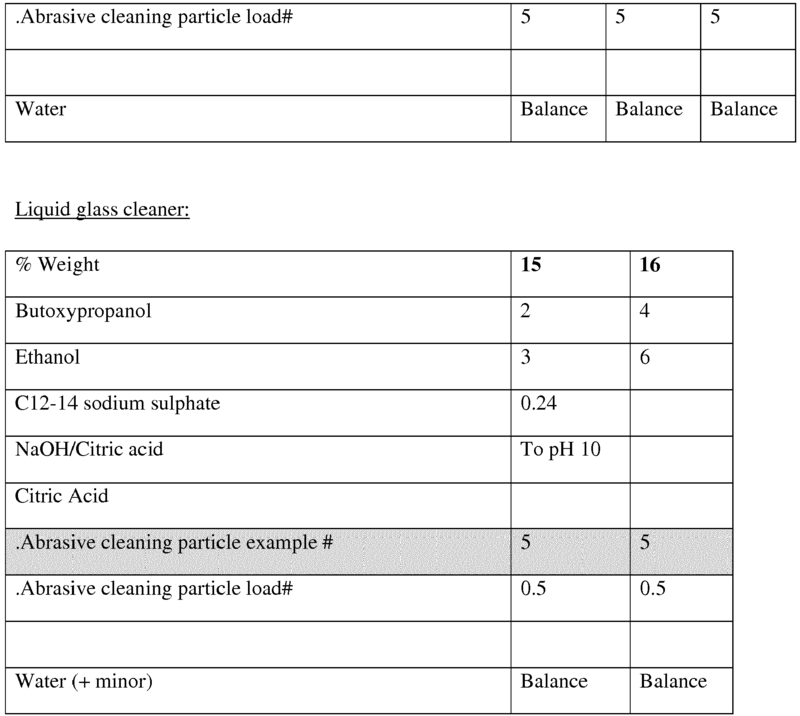 The applicant has surprisingly further discovered that efficient cleaning result can be achieved with particle population occupying a large volume per mass of particles loaded in a cleaning composition. The volume that the particles will occupy is defined by the packing density of the particles. The packing density of a particle population represents the mass of a sample of particle population divided by the volume occupied by the particles sample measured in dry condition after packing with normal gravity force. Incidentally, a particle population with low packing density will occupy a high volume, both in cleaner and during cleaning operation to provide effective cleaning performance, while a particle sample with high packing density will occupy a low volume, both in cleaner and during cleaning operation hence providing low effective cleaning performance. Indeed, particles with low packing density are effective at providing maximum contact area between the abrasive particles and the soil and/or surface to be cleaned. And therefore, lower quantity of abrasive particles can be used in cleaning composition i.e., below 10% vs. commonly above 20%, while delivering equal or better cleaning effectiveness. It is commonly known, that higher quantity of particles in the cleaning composition leads to a better cleaning effectiveness, additionally a higher mass of particle was used to maximize the cleaning performance. The applicant has established that the cleaning efficiency is rather impacted by the volume that the abrasive population occupies at the cleaning interface versus typically the mass of the abrasive population. Incidentally, particles with low packing density typically require lower mass load of the abrasive in the cleaner versus high packing density particles to produce efficient cleaning. However, specifically when generating abrasive particles by fragmenting a foam structure as an example made of a biodegradable thermoplastic material such as biodegradable polyesters (versus for example fragmenting foams made of other polymers such as polyurethanes), too low packing density often results in particles that are more fragile in nature inevitably impacting the cleaning behaviour. Thus, specifically for thermoplastic materials, choosing the correct packing density may be more important. The applicant has found that abrasive population with high packing density feature low cleaning performance while, on the other hand, abrasive population with lower packing density has intrinsic fragility that is also inadequate for cleaning purpose via mechanical abrasion. Incidentally, the applicant has found out that the abrasive cleaning particles having a packing density from 10 kg/m3 to 250 kg/m3, preferably from greater than 30 kg/m3 to less than 250 kg/m3, more preferably from 50 kg/m3 to 200 kg/m3, even more preferably from 80 kg/m3 to 180 kg/m3, preferably from greater than 100 kg/m3 to 160 kg/m3, more preferably from greater than 100 kg/m3to less than 150 kg/m3, are providing improved cleaning performance and surface safety when the material is a thermoplastic material. The packing density herein is calculated according to the following method: One tenth of a gram (0.1 g +/- 0.001 g) of dry particles is placed into a 20 ml precise metric graduated Pyrex® volumetric cylinder (as available from Sigma-Aldrich). The cylinder is sealed (e.g. with a stopper or film), and subsequently shaken using a Vortex mixer (for example, the model L-46 Power Mix from Labinco DNTE SP-016) at 2500 rpm (maximum speed) for 30 seconds. The volume of the particles is measured after vibration. If the volume is between 5 to 15 ml, this is converted accordingly into packing density as expressed in kg/m3. If the volume of 0.1 g is less than 5 ml, then two tenths of a gram (0.2 g +/- 0.001 g) of dry particles is used to re-run the test in clean cylinder. If the volume of the 0.2g is less than 5 ml, then half a gram (0.5 g +/- 0.001 g) of dry particles is used to re-run the test in a clean cylinder. If the volume of the 0.5g is less than 5 ml, then one gram (1.0 g +/- 0.001 g) of dry particles is used to re-run the test in a clean cylinder, with volumes between 3 to 15ml converted into kg/m3 for packing density. Foaming processes and foam structures are typically achieved via a gas expansion process, e.g. : either by injecting gas or solvent within the abrasive precursor and allowing expansion by pressure drop and/or increase of temperature, e.g. : extrusion foaming process. In that case, thermoplastic material in a form of pure polymer or polymer blend or plasticized polymers etc. are usually used. Typical gases used in such processes are air, nitrogen, carbon dioxide or organic solvents such as pentane, cyclopentane, etc with or without inclusion of nucleation and foam stabilizing agents. In most cases, a controlled amount of gas is allowed to dissolve into the polymer / polymeric mix into in melted phase whereas the skilled operator can control accurately the foaming parameters e.g. : formulation, time/temperature/pressure cycle parameters to target specific foam structures. Foaming processes and foam structures are also typically achieved via emulsion foaming of monomers followed by a hardening step via chemical, heat or radiative, e.g. : UV, curing and if necessary followed by a drying step of the solidified foam. Several monomer types are possible to use e.g. : those derived from the non-exhaustive list of the following monomer structures e.g. : vinyl, styrene, acrylate, methacrylate, diene, etc. Examples of materials and foaming and curing process are extensively described in literature (e.g. : refer to the book "Emulsion Polymer Technology" by Robert D. Athey). A preferred route for production of the foam is to form a water/oil High Internal Phase Emulsion of water in the monomer mixture and polymerize in-situ, as described in US 6369121 to Catalfamo et al , incorporated by reference herein. In a preferred embodiment the foam is produced after polymerization of a divinyl benzene cross-linked styrene polymer using a water /oil High internal Phase Emulsion process. After curing, the foam is then reduced to particles via a grinding or milling operation. Foaming processes and foam structures are also typically achieved by mechanical agitation e.g. ; battering of a viscous mix e.g. : typically including protein with emulsifying and possibly stabilizing features followed by a step of curing / hardening and if necessary drying of the solidified foam. Non-exhaustive examples of proteins are white egg or pure albumen, gelatin, saponin, gluten, soybean protein, globulin, prolamine, glutelin, histone, protamine, etc. whereas the proteins are often agitated in presence of water, emulsifying agent, stabilizers e.g. : alginic acid, and, very desirably, a significant amount of polymerizable monomer and/crosslinker to achieve sufficient hardness of the foam. For further reference refer to the book "Functionality of Proteins in Food" by Joseph F. Zayas, "Protein Functionality in Food Systems" from Hettiarachchy, Article in Journal of Cereal science 47 (2008) 233-238 by E.Zukowska et Al; or US2006/0065159 . Foaming process are also achieved via typical foaming process involved in foaming polyurethane material via the reaction of isocyanate and polyol reactant as described in application WO2012/177676 and WO2011/133508 . One suitable way of reducing the foam into the abrasive cleaning particles herein is to grind or mill the foam. A grinding process is described in US 6,699,963 B2 , in which the polymer is ground in slurry of ice and water. Other suitable means include the use of eroding tools such as a high speed eroding wheel with dust collector wherein the surface of the wheel is engraved with a pattern or is coated with abrasive sandpaper or the like to promote the foam to form the biodegradable abrasive cleaning particles herein. Alternatively and in a highly preferred embodiment herein, the foam may be reduced to particles in several stages. First the bulk foam can be broken into pieces of a few cm dimensions by manually chopping or cutting, or using a mechanical tool such as a lumpbreaker, for example the Model 2036 from S Howes, Inc. of Silver Creek, NY, whereas the foam pieces are thereafter ground or milled into finer abrasive particles which have little remaining cell structure by subsequent grinding process e.g. : using a roll mill, rotor mill, jet impact mill, etc. 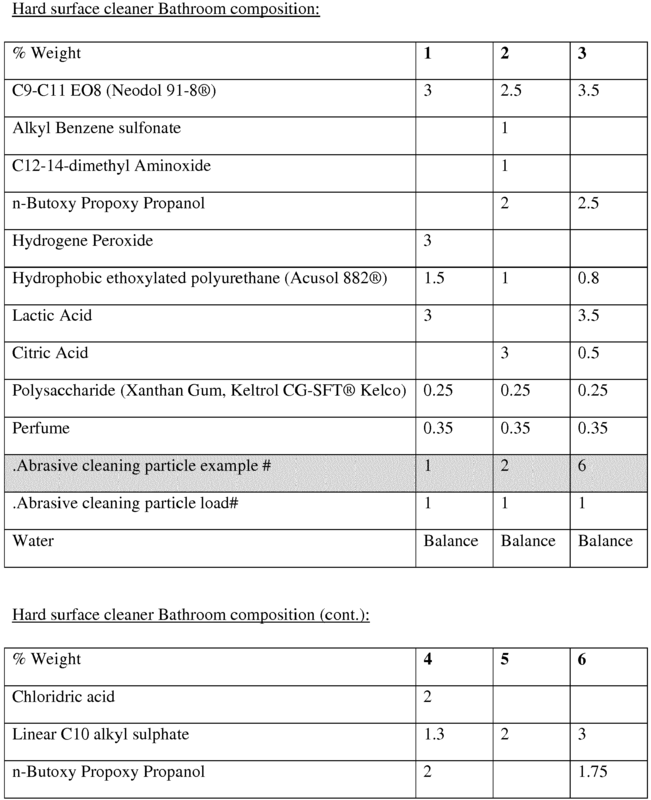 The applicant has found that efficacious and safe cleaning particles can be produced from foams with very specific structural parameters as described below. Indeed the applicant has found that the structure of the foam allows the shape parameters of the cleaning particles to be controlled and the applicant has demonstrated that the particle shape parameters greatly impact the cleaning performance of the particles. Even more surprisingly, it has been found that the filler particles enable to generate even better abrasive particle shapes than without, the size of which not only impacts such particle shape control but also biodegradability. It is understood that the foam structural parameters described below have a direct impact on the desired particle shape after grinding of the foam into abrasive particles; hence the accurate control of the foam structure is a preferred and convenient means to synthesized efficient abrasive particles. The applicant has found that a good cleaning effect can be achieved with abrasive particles which have been made from foam having a density above 200 kg/m3, and even up to 500 kg/m3. However the applicant has surprisingly found that a significantly better cleaning effect can be achieved with a foam density below 200 kg/m3, more preferably with a foam density from 10 kg/m3 to 200kg/m3 and most preferably with a foam density from 30 kg/m3 to 180 kg/m3 and preferably from 50 kg/m3 to 160 kg/m3 Foam density can be measured, for instance, using the protocol described in ASTM D3574. Similarly, the applicant has found that a good cleaning effect can be achieved with abrasive particles which have been made from foams featuring cell sizes ranging from 20 micrometers to 2000 micrometers. However the applicant has surprisingly found that a significantly better cleaning effect can be achieved with foams featuring cell sizes between 100-1000 micrometers, more preferably from 200 to 500 micrometers and most preferably from 300 to 450 micrometers. Foam cell size can be measured for instance using the protocol described in ASTM D3576. Similarly, the applicant has found that a good cleaning effect can be achieved with abrasive particles which have been made from foams featuring close-cell structures. However, the applicant has surprisingly found that a significantly better cleaning effect can be achieved with abrasive cleaning particles, which have been reduces into particles from foams with open-cell structure. An open-cell foam structure presents the opportunity to form well defined sharp struts, which in turn produce effective abrasive particles. On the contrary, the presence of closed cells, wherein each cell is closed by foam material extending from each strut into a membrane-like material, produce after grinding into abrasive particles an abrasive population that contains a fraction of flat-shaped residue. This flat-shaped residue is not providing effective cleaning performance, and therefore, is undesirable feature. The shape of this flat-shaped residue is sub-optimal to deliver cleaning. Additionally, these membranes are inherently very fragile and are easily broken into significantly small particles, including undesirable dust, with sizes ranging from several hundred micrometers to sub-micrometer sizes during the grinding of the foam and also during use in the cleaning process. The applicant has found that foam structures with less than 50%, preferably less than 30%, and most preferably less than 15% of closed cells are desirable in producing effective abrasive cleaning particles. Similarly, the applicant has found that a good cleaning effect can be achieved with abrasive particles which have been made from the foams featuring struts with high aspect ratios. By struts, the applicant defines the elongated material that interconnect to form the cellular structure of the foam, which is best described as a pentagonal dodecahedron structure for the foams with density typically between 50 and 160 kg/m3 targeted herein. The strut length (L) is typically counted as the distance between the geometrical centers of 2 interconnecting knots. The struts thickness (T) is typically the projected strut thickness at the middle of the strut length. The applicant has understood that particles that are derived from foam presenting struts with excessively small L/T ratio present sub-optimal shapes for cleaning since likely to produce rounder particles that readily roll. On the contrary, the particles that are derived from foam presenting struts with excessively high L/T ratio also present sub-optimal shape for cleaning since they are likely to produce excessive amount of rod-like particles featuring low soil removal. Incidentally, the applicant has surprisingly found that significantly better cleaning effect can be achieved with struts having an L/T ratio ranging from 1.5 to 10, preferably from 2.0 to 8.0 and more preferably from 3.0 to 6.0 and most preferred from 3.5 to 4.5 as defined by Visiocell software. In a preferred embodiment, in order to favor the reduction of the foam into particles, the foam is sufficiently brittle, i.e. upon stress, the foam has little tendency to deform but rather will break into particles. Efficient cleaning particles are therefore produced by grinding the foam structure with special care to target size and shape. Hence for instance, when large particle size is desired, foam with large cell size is desirable and vice-et-versa. Additionally, in order to preserve an optimal particle shape while grinding the foam structure, it is recommended to not target particle size excessively below the dimension of the cell size of the foam. Typically, the applicant recommends targeting particle size not below about half of the foam cell size. The applicant has found that excessive particle reduction e.g. : vis-à-vis the original foam structure and especially vis-à-vis the cell size yields rounder particles with sub-optimal cleaning efficiency. 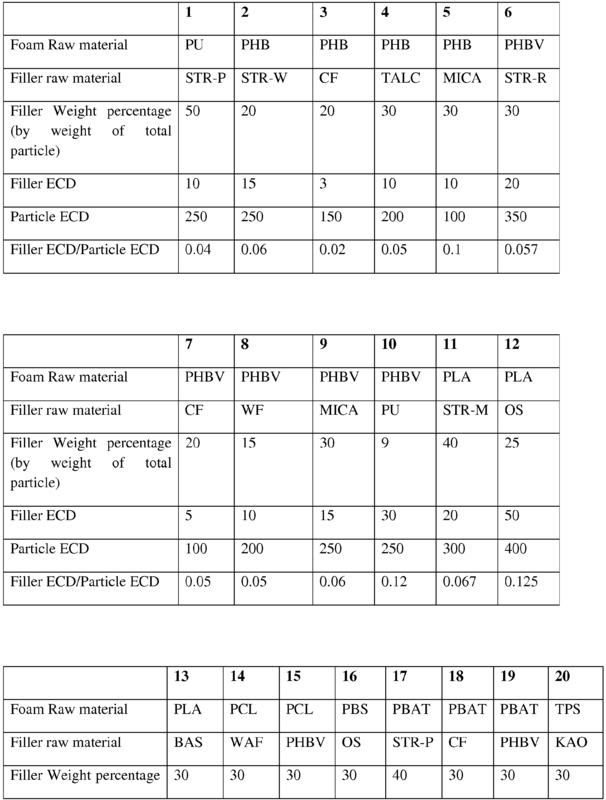 In practice, the process to reduce the foam into particle population is set such as the amount of particles with size below half of the average foam cell size is below 30% by weight, preferably below 20% more preferably below 10% and most preferably no particles are detected, whereas the particle size weight proportion is defined by physical sieving method. Note: In order to proceed to the separation of the particles based on size related to half of the average foam cell size, a tolerance of 10% is accepted for the selection of the sieving mesh vis-à-vis the theoretical target sieving grid. The selected sieving mesh tolerance is valid for smaller available sieving mesh vs. the theoretical target size. Preferred abrasive cleaning particles suitable for used herein are hard enough to provide good cleaning/cleansing performance, whilst providing a good surface safety profile. The hardness of the abrasive particles reduced from the foam can be modified by changing the raw material used to prepare the foam.. When the abrasive cleaning particles are made of inorganic and/or mineral materials, they may have a hardness expressed accordingly to the MOHS hardness scale. Preferably, the MOHS hardness is comprised between 0.5 and 3.5 and most preferably between 1 and 3. The MOHS hardness scale is an internationally recognized scale for measuring the hardness of a compound versus a compound of known hardness, see Encyclopedia of Chemical Technology, Kirk-Othmer, 4 th Edition Vol 1, page 18 or Lide, D.R (ed) CRC Handbook of Chemistry and Physics, 73 rd edition, Boca Raton, Fla.: The Rubber Company, 1992-1993. Many MOHS Test kits are commercially available containing material with known MOHS hardness. For measurement and selection of abrasive material with selected MOHS hardness, it is recommended to execute the MOHS hardness measurement with un-shaped particles e.g. : with spherical or granular forms of the abrasive material since MOHS measurement of shape particles will provide erroneous results. When the abrasive cleaning particles are made of materials other than in-organic and/or mineral materials, they may have a hardness from 3 to 50 kg/mm2, preferably from 4 to 25 kg/mm2 and most preferably from 5 to 15 kg/mm2 on the HV Vickers hardness. Vickers hardness HV is measured at 23 °C according to standard methods ISO 14577-1, ISO 14577-2, ISO 14577-3. The Vickers hardness is measured from a solid block of the raw material at least 2 mm in thickness. The Vickers hardness micro indentation measurement is carried out by using the Micro-Hardness Tester (MHT), manufactured by CSM Instruments SA, Peseux, Switzerland. As per the ISO 14577 instructions, the test surface should be flat and smooth, having a roughness (Ra) value less than 5% of the maximum indenter penetration depth. For a 200 µm maximum depth this equates to a Ra value less than 10 µm. As per ISO 14577, such a surface may be prepared by any suitable means, which may include cutting the block of test material with a new sharp microtome or scalpel blade, grinding, polishing or by casting melted material onto a flat, smooth casting form and allowing it to thoroughly solidify prior testing. Preferably, the non-spherical particles herein have a multitude of sharp edges. The sharp edges of the non-spherical particles are defined by edge having a tip radius below 20 µm, preferably below 8 µm, most preferably below 5 µm. The tip radius is defined by the diameter of an imaginary circle fitting the curvature of the edge extremity. In a preferred embodiment, the abrasive cleaning particles have a mean ECD from 100 µm to 600 µm, preferably from 150 to 500 µm, more preferably from 150 µm to 400 µm, even more preferably from 150 to 350 µm. In one preferred example, the size of the abrasive cleaning particles used in the present invention is modified during usage especially undergoing significant size reduction. Hence the particle remain visible or tactile detectable in liquid composition and at the start of the usage process to provide effective cleaning. As the cleaning process progresses, the abrasive particles disperse or break into smaller particles and become invisible to an eye or tactile undetectable. This effect is better improved by the incorporation of filler particles of the present invention. It has surprisingly been found that the abrasive cleaning particles of the present invention show a good cleaning performance even at relatively low levels, such as preferably from 0.1% to 10% by weight of the total composition, preferably from 0.1% to 5%, more preferably from 0.5% to less than 5%, even more preferably from 1.0% to 3%, by weight of the total composition of said abrasive cleaning particles. The particles used in the present invention can be white, transparent or colored by use of suitable dyes and/or pigments. Additionally suitable color stabilizing agents can be used to stabilize desired color. The abrasive particles are preferable color stable particles. By "color stable" it is meant herein that color of the particles used in the present invention will not turn yellow during storage and use. However, it is preferred herein that the abrasive cleaning particles are stably suspended in the liquid compositions herein. Thus the compositions herein comprise a suspending aid. The compositions herein may comprise a nonionic, anionic, zwitterionic, cationic and amphoteric surfactant or mixtures thereof. Suitable surfactants are those selected from the group consisting of nonionic, anionic, zwitterionic, cationic and amphoteric surfactants, having hydrophobic chains containing from 8 to 18 carbon atoms. Examples of suitable surfactants are described in McCutcheon's Vol. 1: Emulsifiers and Detergents, North American Ed., McCutcheon Division, MC Publishing Co., 2002. Preferably, the composition herein comprises from 0.01% to 20% by weight of the total composition of a surfactant or a mixture thereof, more preferably from 0.5% to 10%, and most preferably from 1% to 5%. Non-ionic surfactants are highly preferred for use in the compositions of the present invention. Non-limiting examples of suitable non-ionic surfactants include alcohol alkoxylates, alkyl polysaccharides, amine oxides, block copolymers of ethylene oxide and propylene oxide, fluoro surfactants and silicon based surfactants. Preferably, the aqueous compositions comprise from 0.01% to 20% by weight of the total composition of a non-ionic surfactant or a mixture thereof, more preferably from 0.5% to 10%, and most preferably from 1% to 5%. A preferred class of non-ionic surfactants suitable for the present invention is alkyl ethoxylates. The alkyl ethoxylates of the present invention are either linear or branched, and contain from 8 carbon atoms to 16 carbon atoms in the hydrophobic tail, and from 3 ethylene oxide units to 25 ethylene oxide units in the hydrophilic head group. Examples of alkyl ethoxylates include Neodol 91-6®, Neodol 91-8® supplied by the Shell Corporation (P.O. Box 2463, 1 Shell Plaza, Houston, Texas), and Alfonic 810-60® supplied by Condea Corporation, (900 Threadneedle P.O. Box 19029, Houston, TX). More preferred alkyl ethoxylates comprise from 9 to 12 carbon atoms in the hydrophobic tail, and from 4 to 9 oxide units in the hydrophilic head group. A most preferred alkyl ethoxylate is C9-11 EO5, available from the Shell Chemical Company under the tradename Neodol 91-5®. Non-ionic ethoxylates can also be derived from branched alcohols. For example, alcohols can be made from branched olefin feedstocks such as propylene or butylene. In a preferred embodiment, the branched alcohol is either a 2-propyl-1-heptyl alcohol or 2-butyl-1-octyl alcohol. A desirable branched alcohol ethoxylate is 2-propyl-1-heptyl EO7/AO7, manufactured and sold by BASF Corporation under the tradename Lutensol XP 79 /XL 79®. Another class of non-ionic surfactant suitable for the present invention is alkyl polysaccharides. Such surfactants are disclosed in U.S. Patent Nos. 4,565,647 , 5,776,872 , 5,883,062 , and 5,906,973 . Among alkyl polysaccharides, alkyl polyglycosides comprising five and/or six carbon sugar rings are preferred, those comprising six carbon sugar rings are more preferred, and those wherein the six carbon sugar ring is derived from glucose, i.e., alkyl polyglucosides ("APG"), are most preferred. The alkyl substituent in the APG chain length is preferably a saturated or unsaturated alkyl moiety containing from 8 to 16 carbon atoms, with an average chain length of 10 carbon atoms. C8-C16 alkyl polyglucosides are commercially available from several suppliers (e.g., Simusol® surfactants from Seppic Corporation, 75 Quai d'Orsay, 75321 Paris, Cedex 7, France, and Glucopon 220®, Glucopon 225®, Glucopon 425®, Plantaren 2000 N®, and Plantaren 2000 N UP®, from Cognis Corporation, Postfach 13 01 64, D 40551, Dusseldorf, Germany). Suitable alkyl alkoxylated sulphate surfactants for use herein are according to the formula RO(A)mSO3M wherein R is an unsubstituted C6-C20 alkyl or hydroxyalkyl group having a C6-C20 alkyl component, preferably a C12-C20 alkyl or hydroxyalkyl, more preferably C12-C18 alkyl or hydroxyalkyl, A is an ethoxy or propoxy unit, m is greater than zero, typically between 0.5 and 6, more preferably between 0.5 and 3, and M is H or a cation which can be, for example, a metal cation (e.g., sodium, potassium, lithium, calcium, magnesium, etc. ), ammonium or substituted-ammonium cation. Alkyl ethoxylated sulfates as well as alkyl propoxylated sulfates are contemplated herein. Specific examples of substituted ammonium cations include methyl-, dimethyl-, trimethyl-ammonium and quaternary ammonium cations, such as tetramethyl-ammonium, dimethyl piperdinium and cations derived from alkanolamines such as ethylamine, diethylamine, triethylamine, mixtures thereof, and the like. Exemplary surfactants are C12-C18 alkyl polyethoxylate (1.0) sulfate (C12-C18E(1.0)SM), C12-C18 alkyl polyethoxylate (2.25) sulfate (C12-C18E(2.25)SM), C12-C18 alkyl polyethoxylate (3.0) sulfate (C12-C18E(3.0)SM), C12-C18 alkyl polyethoxylate (4.0) sulfate (C12-C18E (4.0)SM), wherein M is conveniently selected from sodium and potassium. Other anionic surfactants useful herein include salts (including, for example, sodium, potassium, ammonium, and substituted ammonium salts such as mono-, di- and triethanolamine salts) of soap, C8-C24 olefinsulfonates, sulphonated polycarboxylic acids prepared by sulphonation of the pyrolyzed product of alkaline earth metal citrates, e.g., as described in British patent specification No. 1,082,179 , C8-C24 alkylpolyglycolethersulfates (containing up to 10 moles of ethylene oxide); alkyl ester sulfonates such as C14-C16 methyl ester sulfonates; acyl glycerol sulfonates, fatty oleyl glycerol sulfates, alkyl phenol ethylene oxide ether sulfates, alkyl phosphates, isethionates such as the acyl isethionates, N-acyl taurates, alkyl succinamates and sulfosuccinates, monoesters of sulfosuccinate (especially saturated and unsaturated C12-C18 monoesters) diesters of sulfosuccinate (especially saturated and unsaturated C6-C14 diesters), acyl sarcosinates, sulfates of alkylpolysaccharides such as the sulfates of alkylpolyglucoside (the nonionic nonsulfated compounds being described below), alkyl polyethoxy carboxylates such as those of the formula RO(CH2CH2O)kCH2COO-M+ wherein R is a C8-C22 alkyl, k is an integer from 0 to 10, and M is a soluble salt-forming cation. Resin acids and hydrogenated resin acids are also suitable, such as rosin, hydrogenated rosin, and resin acids and hydrogenated resin acids present in or derived from tall oil. Further examples are given in "Surface Active Agents and Detergents" (Vol. I and II by Schwartz, Perry and Berch). A variety of such surfactants are also generally disclosed in U.S. Patent 3,929,678, issued December 30, 1975 to Laughlin, et al. at Column 23, line 58 through Column 29, line 23. Another class of preferred surfactants comprises the group consisting of amphoteric surfactants. One suitable amphoteric surfactant is a C8-C16 amido alkylene glycinate surfactant ('ampho glycinate'). Another suitable amphoteric surfactant is a C8-C16 amido alkylene propionate surfactant ('ampho propionate'). Other suitable, amphoteric surfactants are represented by surfactants such as dodecylbeta-alanine, N-alkyltaurines such as the one prepared by reacting dodecylamine with sodium isethionate according to the teaching of U.S. Patent No. 2,658,072 , N-higher alkylaspartic acids such as those produced according to the teaching of U.S. Patent No. 2,438,091 , and the products sold under the trade name "Miranol®", and described in U.S. Patent No. 2,528,378 . Polyfunctionally-substituted aromatic chelating agents may also be useful in the compositions herein. See U.S. patent 3,812,044, issued May 21, 1974, to Connor et al. Preferred compounds of this type in acid form are dihydroxydisulfobenzenes such as 1,2-dihydroxy -3,5-disulfobenzene. Suitable amino carboxylates for use herein include ethylene diamine tetra acetates, diethylene triamine pentaacetates, diethylene triamine pentaacetate (DTPA),N-hydroxyethylethylenediamine triacetates, nitrilotri-acetates, ethylenediamine tetrapropionates, triethylenetetraaminehexa-acetates, ethanol-diglycines, propylene diamine tetracetic acid (PDTA) and methyl glycine di-acetic acid (MGDA), both in their acid form, or in their alkali metal, ammonium, and substituted ammonium salt forms. Particularly suitable amino carboxylates to be used herein are diethylene triamine penta acetic acid, propylene diamine tetracetic acid (PDTA) which is, for instance, commercially available from BASF under the trade name Trilon FS® and methyl glycine di-acetic acid (MGDA). The compositions herein may be packaged in a variety of suitable packaging known to those skilled in the art, such as plastic bottles for pouring liquid compositions, squeeze bottles or bottles equipped with a trigger sprayer for spraying liquid compositions. Alternatively, the paste-like compositions according to the present invention may by packaged in a tube. The composition herein may be applied using an appropriate implement, such as a mop, paper towel, brush (e.g., a toothbrush) or a cloth, or applied directly by hand, soaked in the diluted or neat composition herein. Furthermore, once applied onto said surface said composition may be agitated over said surface using an appropriate implement. Indeed, said surface may be wiped using a mop, paper towel, brush or a cloth. The process herein may additionally contain a rinsing step, preferably after the application of said composition. By "rinsing", it is meant herein contacting the surface cleaned/cleansed with the process according to the present invention with substantial quantities of appropriate solvent, typically water, directly after the step of applying the liquid composition herein onto said surface. By "substantial quantities", it is meant herein between 0.01 lt. and 1 lt. of water per m2 of surface, more preferably between 0.1 lt. and 1 lt. of water per m2 of surface. In a preferred embodiment herein, process of cleaning is a process of cleaning household hard surfaces with a liquid composition according to present invention. These following compositions were made comprising the listed ingredients in the listed proportions (weight %). Examples 1-16 herein are meant to exemplify the present invention but are not necessarily used to limit or otherwise define the scope of the present invention. 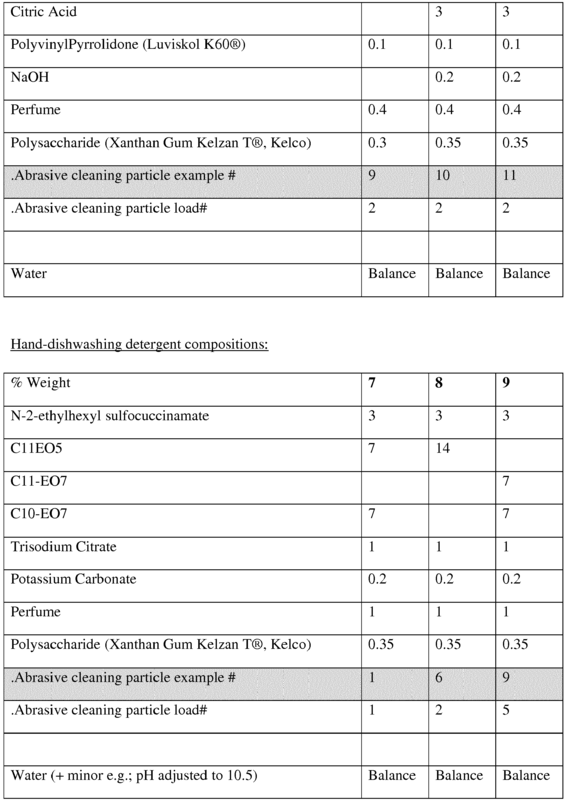 A liquid cleaning and/or cleansing composition comprising non-spherical and/or non-rolling abrasive cleaning particles derived from a foam structure comprising a plurality of struts, wherein said abrasive cleaning particles comprise a plurality of filler particles at least partly incorporated therein, characterized in that the particle size of said abrasive cleaning particles is greater than the particle size of said filler particles and wherein the ratio of the mean area-equivalent diameter of said filler particles to said abrasive cleaning particles is from 0.01 to 0.2, the area-equivalent diameter being measured according to ISO 9276-6. A liquid cleaning and/or cleansing composition according to claim 1 wherein the abrasive cleaning particles have a packing density of from greater than 50 kg/m3 to less than 200 kg/m3, preferably from greater than 50 kg/m3 to less than 180 kg/m3, more preferably from greater than 100 kg/m3 to less than 150 kg/m3. A liquid cleaning and/or cleansing composition according to any of the preceding claims wherein the abrasive cleaning particles comprise, preferably consist of, a biodegradable material, preferably a biodegradable thermoplastic material, and that the abrasive cleaning particles are biodegradable abrasive cleaning particles having a biodegradability rate of more than 50% according to ASTM6400 test method. A liquid cleaning and/or cleansing composition according to any of the preceding claims wherein the filler particles have an area-equivalent diameter of from 1 µm to 70 µm, preferably 1 µm to less than 60 µm, more preferably from 2 µm to 50 µm, even more preferably from 2 µm to less than 45 µm, most preferably from 5 µm to less than 30 µm, as measured according to ISO 9276-6. A liquid cleaning and/or cleansing composition according to any of the preceding claims wherein the filler particles comprise a material selected from the group consisting of organic, in-organic and mixtures thereof, preferably wherein the organic material is selected from vegetal feedstock essentially cellulose or lignocellulose based material preferably selected from nut shell, wood, cotton, flax or bamboo fibers, corn cob, rice hull, sugars and/or more generally carbohydrates especially starch preferably from corn, maize, potato, or urea; other plant parts selected from the group consisting of stems, roots, leaves, seeds; polyesters; biodegradable polyesters preferably selected from the group consisting of polyhydroxy-alkanoates, poly(lactic acid), polycaprolactone, polyesteramide, aliphatic and/or copolyesters, and mixtures thereof; and mixtures thereof; preferably the in-inorganic material being selected from the group consisting of carbonate or sulfate salt, phyllosilicate material and mixtures thereof, preferably talc, kaolinite, vermiculite, mica, muscovite, pyrophillite, bentonite, montmorrillonite, feldspar, and mixtures thereof. A liquid cleaning and/or cleansing composition according to any of the preceding claims wherein the filler particles are comprised at a level of from 5% to 60%, preferably from 10% to 60%, preferably from greater than 15% to 60%, more preferably from 20% to 60%, most preferably from greater than 30% to 60%, by weight of the abrasive cleaning particle. A liquid cleaning and/or cleansing composition according to claim 3 wherein the biodegradable material is a selected from the group consisting of biodegradable thermoplastic polyesters preferably selected from the group consisting of polyhydroxy-alkanoates preferably selected from polyhydroxyButyrate, polyhydroxyButyrate-co-valerate, polyhydroxyButyrate-co-hexanoate and mixtures thereof, poly(lactic acid), polycaprolactone, polyesteramide, aliphatic and/or, aromatic copolyesters preferably selected from co-polyester containing mix of succinic, adipic, terepthalic diacids, propanediol, butanediol, pentanediol monomer and mixtures thereof; thermoplastic starch; and mixtures thereof. A liquid cleaning and/or cleansing composition according to any of the preceding claims wherein the filler material is a high amylose containing starch material wherein the amylose content is above 30%, preferably above 50% of the total starch weight. A liquid cleaning and/or cleansing composition according to any of the preceding claims wherein the filler particles are substantially water-insoluble. A liquid cleaning and/or cleansing composition according to claims 1 to 8 wherein the filler particles are water-soluble and are comprised at a level of less than 30%, preferably less than 20%, more preferably less than 15%, most preferably from greater than 0% to less than 10%, by weight of the abrasive cleaning particle. iii. grinding the foam to generate biodegradable abrasive particles. A process according to claim 11 wherein the effective amount of filler particles is more than 15%, preferably from greater than 15% to 60%, more preferably from 30% to 60%, by weight of the composition of the abrasive cleaning particle . A process according to claims 11 or 12 wherein the filler particles are substantially water-insoluble and preferably have a mean area-equivalent diameter of from 1 µm to 60 µm, preferably from 1 µm to 50 µm, more preferably from 2 µm to less than 45 µm, most preferably from 5 µm to less than 30 µm, as measured according to ISO 9276-6. A process according to claims 11 to 13 wherein the thermoplastic material is a biodegradable thermoplastic material selected from the group consisting of biodegradable polyesters preferably selected from the group consisting of polyhydroxy-alkanoates preferably selected from polyhydroxyButyrate, polyhydroxyButyrate-co-valerate, polyhydroxyButyrate-co-hexanoate and mixtures thereof, poly(lactic acid), polycaprolactone, polyesteramide, aliphatic and/or, aromatic copolyesters including co-polyester containing mix of succinic, adipic, terepthalic diacids and propanediol butanediol or pentanediol monomer, thermoplastic starch; and mixtures thereof. A process according to claims 11 to 14 wherein the filler particles comprise a material selected from the group consisting of organic, in-organic and mixtures thereof, preferably wherein the organic material is selected from vegetal feedstock essentially cellulose or lignocellulose based material preferably selected from nut shell, wood, cotton, flax or bamboo fibers, corn cob, rice hull, sugars and/or more generally carbohydrates especially starch preferably from corn, maize, potato, or urea; other plant parts selected from the group consisting of stems, roots, leaves, seeds; polyesters; biodegradable polyesters preferably selected from the group consisting of polyhydroxy-alkanoates, poly(lactic acid), polycaprolactone, polyesteramide, aliphatic and/or copolyesters, and mixtures thereof; and mixtures thereof; preferably the in-inorganic material being selected from the group consisting of carbonate or sulfate salt, phyllosilicate material and mixtures thereof, preferably talc, kaolinite, vermiculite, mica, muscovite, pyrophillite, bentonite, montmorrillonite, feldspar, and mixtures thereof. A process according to claims 11 to 15 wherein the foaming step ii is achieved via extrusion foaming wherein the filler particles further act as nucleating agent to promote speed of crystallization, preferably the blended composition of step i further comprising 3 to 15% by weight of a blowing agent at temperature of from 80 to 240°C and pressure of from 0.5 to 30MPa prior to undergoing a depressurization step at a rate of greater than 0.5MPa/s and preferably less 10MPa/s, more preferably the temperature ranging from the melt temperature of the thermoplastic material, Tm, to Tm minus 60°C. A process according to claims 11 to 16 wherein step iii comprises the steps of converting the foam into foam pieces ranging from 1mm to 100mm in the larger dimension thereof followed by grinding said foam pieces into particles having a mean area-equivalent diameter ranging from 100 to 350 microns by means of a device selected from eroding wheel, roll grinder, rotor mill, blade mill, jet mill, and combinations thereof, wherein the grinding temperature is controlled to remain below T, wherein T = Tm - Tn, and Tn is 30°C, preferably 50°C, more preferably 100°C. 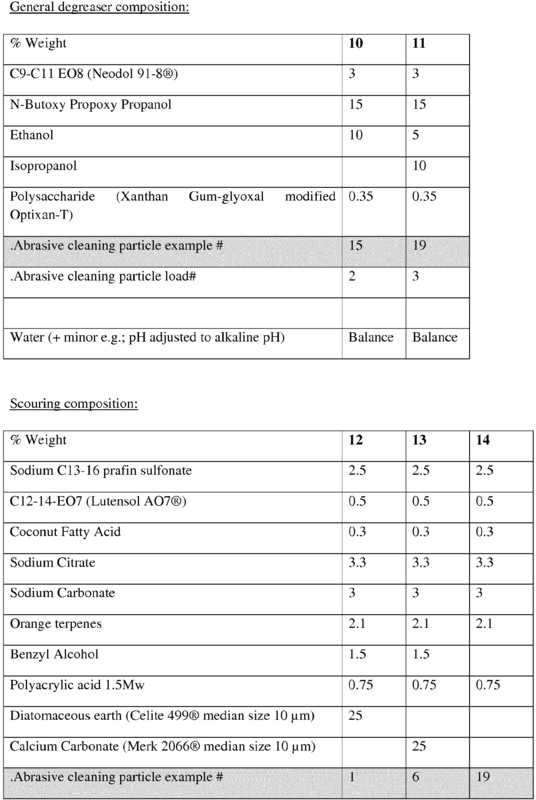 MX2015016440A MX2015016440A (en) 2013-05-29 2014-05-28 Liquid cleaning and/or cleansing composition. MCCUTCHEON'S: "Emulsifiers and Detergents", vol. 1, 2002, MC PUBLISHING CO.
ES2365050T3 (en) 2011-09-21 cleaning composition of hard surfaces. ES2369993T3 (en) 2011-12-09 Laundry article. ES2336072T3 (en) 2010-04-08 Detergent hotpl surfaces.